The guest of honor, Maj. Armstrong, appears second from the left. At the time this photo was taken, he was president of the Club. He also had not long before returned from overseas where he served as an officer in the U.S. Army Signal Corps during World War I, and where he invented the superheterodyne receiver. I do not know whether the men standing with him were clustered there simply to fit into the field of view when the banquet picture was taken or whether they may have been close associates of Armstrong from the war, from Columbia University or from the Radio Club. I know you weren’t there, unless you attended by reverse temporal astral projection, but just in case you may have seen other photographs that would allow you to tell me who is shown in this one: Can you identify the banquet guests posing with Armstrong? Alan S. Douglas, an RCA Fellow from Pocasset, Massachusetts, responded to say that the first individual from the left is Michael I. Pupin, Ph.D., who was a professor at Columbia University and one of Armstrong’s instructors when he was a student there. Prof. Pupin became an honorary member of RCA in 1926. He delivered a speech at the Radio Club banquet that year that was broadcast over New York radio station WMCA. He is the only RCA member to win a Pulitzer Prize. Alan said that the third man from the left is Alfred N. Goldsmith, Ph.D. He was director of research at the Radio Corporation of America when he became an honorary member of the Radio Club in 1922. Dr. Goldsmith was the first editor of the Proceedings of the Institute of Radio Engineers beginning in 1912 and remained in that position for 42 years. He was a member of IRE’s board of directors for all 51 years of the organization’s independent existence and served terms as secretary and president. Thank-you to Alan and Jim for helping with the 1919 banquet photo. I enjoy these ancient photos as a window into RCA’s past. Above is another photo of Harry Sadenwater that Alan might enjoy seeing. This photo was taken in 1914 when Harry was listening for transatlantic signals under the Palisades, across the Hudson River from New York. I visited the Palisades in June 2008 and looked for a likely place where Harry might have set up his radio apparatus, but I couldn’t come close to being sure I was near the spot. 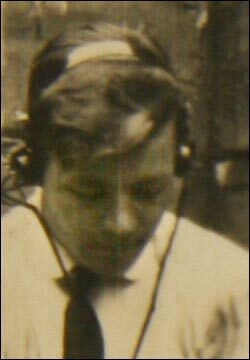 Harry was a ship wireless operator, a government radio inspector, a radio officer in the U.S. Navy and a radio engineer with General Electric and the Radio Corporation of America. He joined the Radio Club in 1913 and was a member of its board of directors 1916-17, 1919-20, 1930, 1932-34 and at other intervals into the 1950s. He was president of the Club in 1931 and corresponding secretary 1946-47. This entry was posted on Thursday, September 4th, 2008 at 12:51 am and is filed under RCA news. You can follow any responses to this entry through the RSS 2.0 feed. You can leave a response, or trackback from your own site.